Ranger has been a respected name in serious fishing circles for a long time, but this was the first time I had gotten behind the wheel of one. I immediately understood why. The sparkling exterior is eye-catching to say the least. The layout of the 621 FS was deeper than I expected, but was still wide-open for fishing. It’s big and it’s heavy so it doesn’t skim along the top of the water; rather, it cuts through it. It’s stable and confident as it manouevres through waves while keeping it a dry ride. We topped out with the 250-hp Mercury at 56 miles per hour. Though, you can go higher and max out the power rating with 300-hp which will allow you to crack 60. There is a ton of storage on board. Slots for pliers and the hand-held tools you need easy access to when fishing are some of the little things I wouldn’t have thought of, but Ranger has. The helm is comfortable and customizable with options of various multifunction displays as well as high or low windshields. An easy-to-decipher row of buttons means the captain can fill the livewell and start the aerator while the first mate sets the lines to maximize fishing time. There are a lot of ways to personalize this boat, but the smooth running hull, high level of craftsmanship and design is standard. 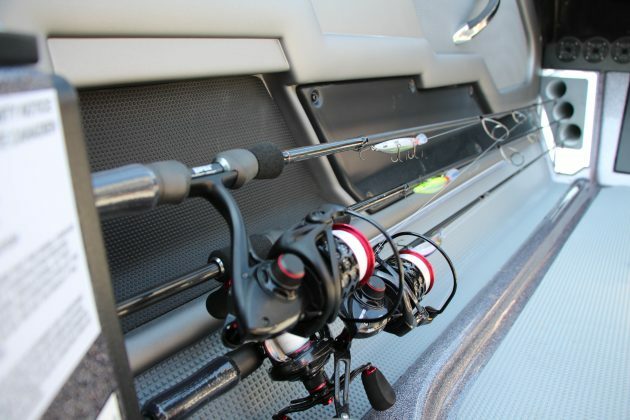 You’ll spend a lot of time using the trolling motor and optional bow-mounted fish finder and making use of the roomy interior while enjoying the runs to and from your favourite fishing spot. 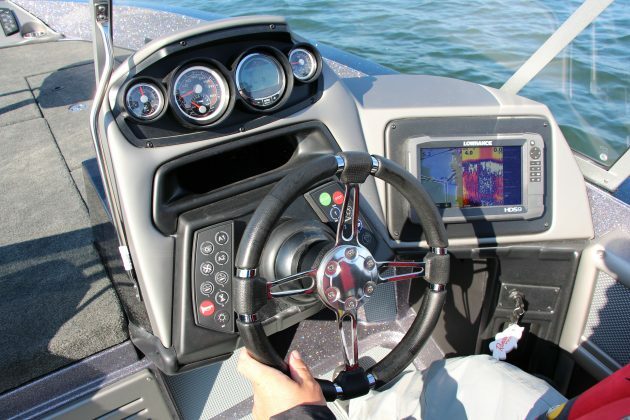 It cruises nicely in the low-to-mid 30’s and with the high windshield blocking the wind, you can easily can chat with your passenger – or start the debate of who caught the bigger fish! 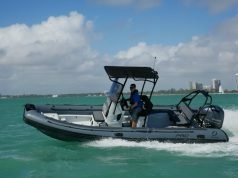 I’ve had the opportunity to fish out of some incredible boats over the years, and trust me when I say the 621 FS has raised the bar in the multispecies industry – Ranger has knocked it out of the park. The driver’s console is nothing short of a fighter jet cockpit. The instrumentation panel is well laid out, including a keyless digital ignition. With plenty of room to flush mount 12-inch monitors, having multiple screens is an option as well. The jutted transom provides extra interior room, as well as a landing platform with boarding ladder. 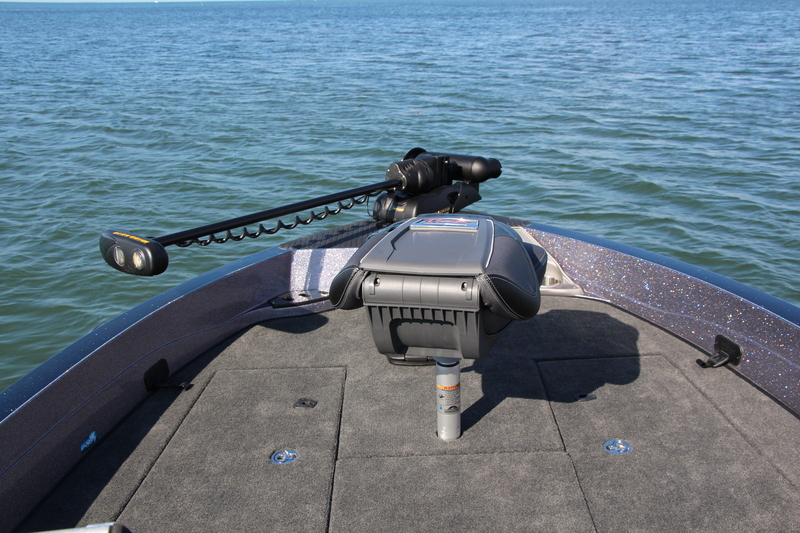 The protruded bow provides extended room for a trolling motor, flush mount electronics, digital remote switching, and cup holder. The storage space on the 621 FS can accommodate the most demanding tournament angler. The patented Power Ventilation System provides forced air through the storage areas to keep gear dry. 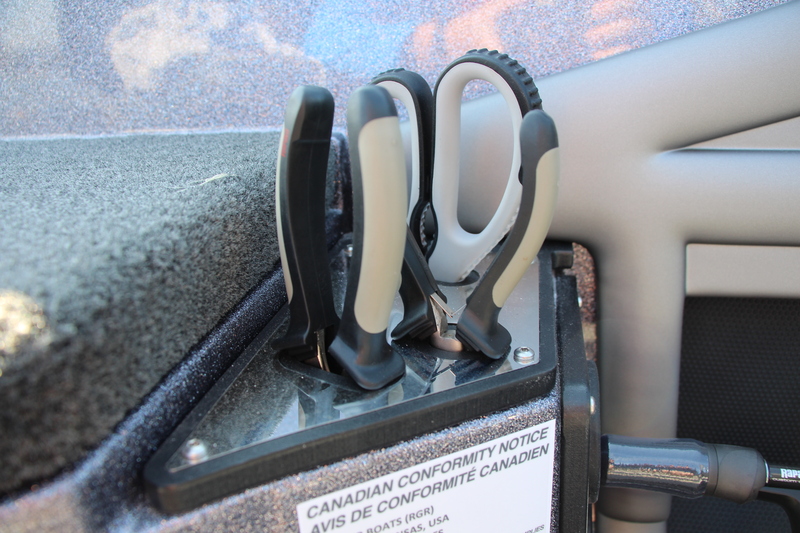 Each compartment also has a self-draining channel with a one-inch lip and rubber gasket to ensure no water can enter. The bow and stern feature recirculating aerated live wells with oxygenator, automatic timer, and live well pump-out. Rod storage is a must on multispecies boats and the 621 FS has plenty. 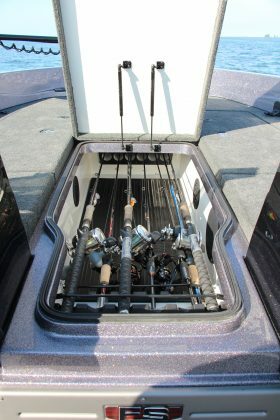 Twelve rods can fit under the front deck’s unique through-console storage up front, as well as in the passenger side’s “run ‘n’ gun” style gunnel storage. Throughout the 621 FS you will find integrated tool holders, cup holders, and a measuring board – gone are the days of attaching a tool holder. A remote drain plug is standard as well. If you are in the market for an elite level tournament-fishing machine, the Ranger 621 FS deserves some serious consideration. 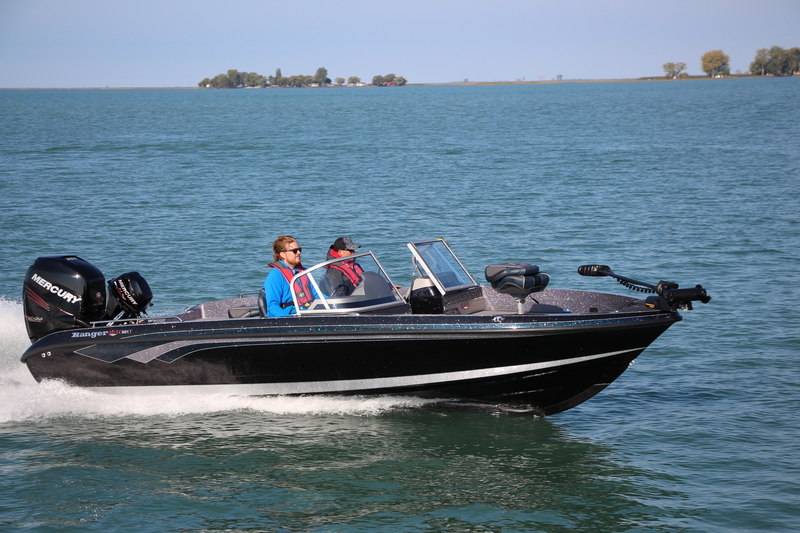 Although it comes with a hefty price tag, you have to consider everything that the people from Ranger have put into this incredible boat – everything you have always asked for and then some.